The cyclonic circulation over southwest Bay of Bengal and adjoining Sri Lanka extending upto 3.1 km above mean sea level persists. The trough in easterlies from the above cyclonic circulation to northwest Bay of Bengal off West Bengal coast extending upto 1.5 km above mean sea level persists. As the above mentioned through is expected to move along Tamil Nadu coast the rains are expected to make a comeback in Tamil Nadu from tomorrow. The rains will be isolated at initial stage but will become widespread after couple of days and also pave way for onset of North East Monsoon if conditions are favorable. 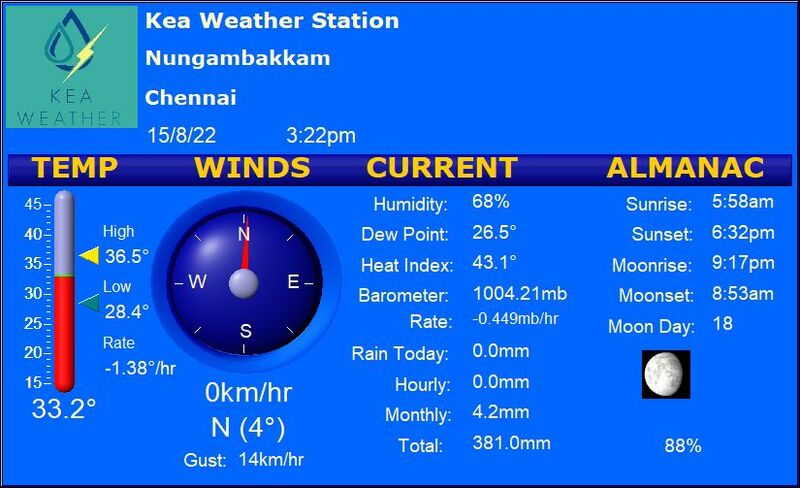 Chennai – Pleasant day in the office, with no chances of rains. (33/24). Vellore – Sunny and warm day expected with Sheets of clouds with no chance of rains. (35/23). Coimbatore – Temperature is likely to be under check with a Chance of Stray showers in the region (31/22). Madurai – Winds keep temperature under check but with minimal chance of precipitation. (31/24). Trichy – Warm weather likely with no chance of precipitation (32/25).